The gist of this horror is that grill brushes have a lifespan, and most people don’t know that because they’re not told/scared silly. But you aren’t most people, because you have me to tell you these things (I love a good fearmongering in the morning). So! Now you know that it’s important to check your grill brush for signs of wear and tear and to get yourself a new one should you observe that the bristles are frayed or starting to come loose. 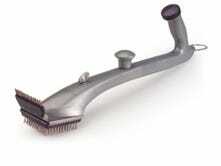 Want some new grill brush recommendations? Sure you do! The Weber 3-sided grill brush can clean the tops of your grates, and also the sides, for under $10. Grill brushes aren’t, generally speaking, overly expensive. But now that you know that they need to be replaced more frequently than you might have imagined, cost may be something to consider when making a purchase. 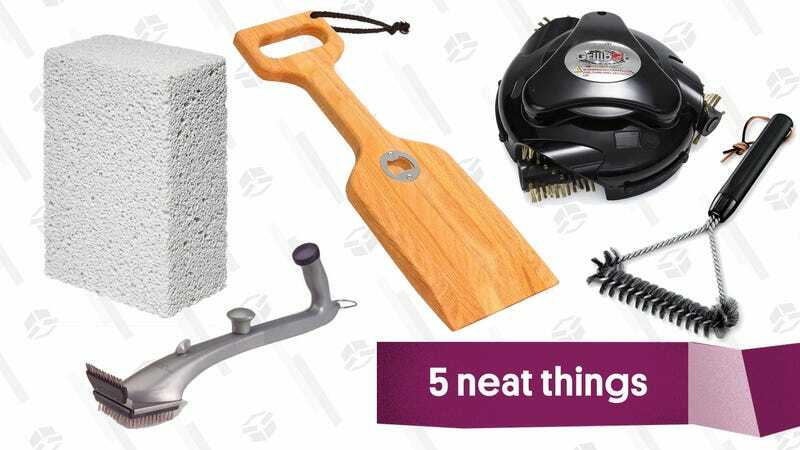 This Weber grill brush is under $10, and it has a few key features that make it a very decent choice beyond its attractive price point. The main brush head is wide, so you can cover the surface area of the grill pretty quickly. 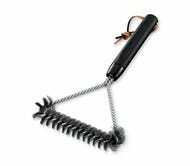 But the sides of the brush are also fitted with bristles, which allows you to turn the brush easily scour the area in between the grill grates. Grill Daddy has a water squirting mechanism to generate steam on a hot grill, which helps clean stuck-on gunk. There are several features that make the Grill Daddy the, well, daddy of grill brushes. (Sorry, I know, and I’m duly ashamed of myself.) First and foremost, this brush is designed with a water chamber that allows you to spritz a hot grill, creating steam. And steam, my friends, is an excellent cleaner; it also does its cleaning thing with just, you know, water, which means you’re not using toxic cleaning products on a place where you’re also cooking your food (oven cleaner, I am looking at you, pal.) The Grill Daddy also has a long handle, which will keep your precious hands at a safe distance from all that steam — steam burns are for real you guys — and a double-sided brush head that allows you to cover both wide swaths and tighter spots of the grill grates. Don’t want to worry about broken-off bristles? This wooden grill scraper is meant to be used on a hot grill, and even has a built-in bottle opener. Okay but let’s say all my fearmongering has turned you off metal grill brushes entirely. Fair enough! There are options for you, my worried friend, and I’m here to offer them up. Wooden grill scrapers exist in this world. 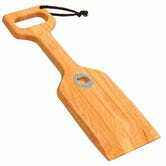 This wooden scraper, which is made of red oak, is paddle shaped, with a beveled edge that will, over time, shape itself to the contours of your particular grill grates. It’s meant to be used on a hot grill, and it can be turned on its side to get in between the grates to remove any food that’s gotten stuck. And fun bonus time! This particular wooden grill scraper comes fitted with a bottle opener. Unlike most grill scrapers, the Magic Stone is meant to be used on a warm grill, not a hot one. Another option for people who want to entirely avoid using a bristled grill brush (are they brushes if they have no bristles? Oh God, I’m never going to sleep again between the Stephen King and the existential questions this job raises for me …) is the Magic Stone. 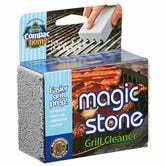 And actually, this is the thing for the real scaredy cats out there, because the Stone is meant to be used on a just-barely warm grill. You can basically think of this thing — which is about the size of a kitchen sponge — as a pumice stone for your grill. Run it over slightly warm grates and it will scour away stuck-on food and greasy residue. Come on, it’s a Roomba for your grill, how cool is that? IT IS A GRILL CLEANING ROBOT WHAT ELSE DO YOU EVEN NEED TO KNOW?? ?